Disney Babies Blog: Disney on Ice presents Let's Celebrate! I have a confession: I have never been to a Disney On Ice production. But, that is all about to change! Between timing, work, and so many other factors, I haven't been to a Disney On Ice show. Honestly, I had to change some things around at work to make it happen this time, but it will happen. With two boys that adore Mickey Mouse (have you seen the new Mickey Mouse shorts on Disney Channel yet? We watch them all daily. Often twice. ), we're going to be stretching our bedtime to check out one of the shows when it comes through Fairfax, VA (i.e. D.C. suburbia) in a few weeks! Make an ordinary day extraordinary by joining Disney On Ice presentsLet’s Celebrate! 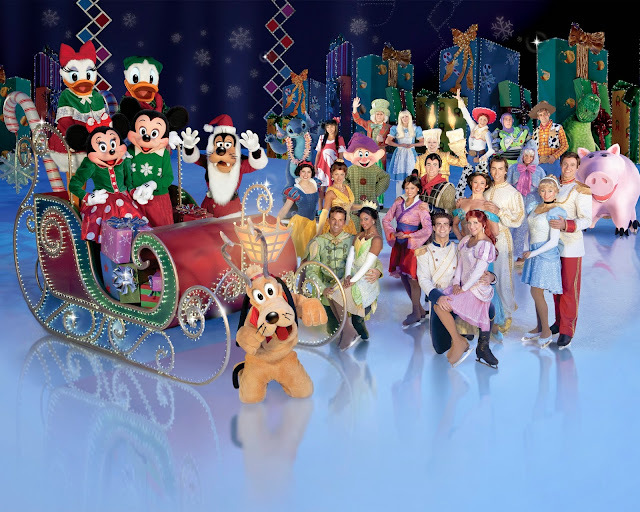 More than 50 of your favorite Disney characters will visit the Patriot Center for one colossal party on ice! The memorable show for all ages will be at the Patriot Center in Fairfax, Va. from October 23-27. Let’s Celebrate is an action-packed show featuring a magical montage of celebrations and is a mix of contemporary music with your favorite Disney tunes. Join Mickey Mouse and Minnie Mouse as they celebrate a Very Merry Unbirthday Party with Alice and the Mad Hatter; Mardi Gras with Princess Tiana and Prince Naveen; a Royal Valentine’s Day Ball with the Disney Princesses; and a Halloween haunt alongside Disney’s most famous Villains in this celebration of the century. Tickets are on-sale now and can be purchased at all Ticketmaster outlets via charge by phone at 1-800-745-3000 > ; via www.ticketmaster.com <http://www.ticketmaster.com> <http://www.ticketmaster.com> <http://www.ticketmaster.com> ; and at the Patriot Center box office. Use coupon code: PRINT by October 18th to save $6! This show is going to have a little bit of everything and I am super excited to see it! And, now I get to offer someone a 4 pack to see Disney on Ice presents Let's Celebrate! at the Patriot Center (at George Mason University) in Fairfax, VA on October 23rd at 7 p.m. - hope you can join me!! My daughter just had her 3rd birthday. We are planning to take her to Disney when she's 4. This would be a great way to start getting excited!